International Financial Statement Analysis provides the most up-to-date detail for the successful assessment of company performance and financial position regardless of country of origin. The seasoned experts at the CFA Institute offer readers a rich, clear reference, covering all aspects from financial reporting mechanics and standards to understanding income and balance sheets. Comprehensive guidance toward effective analysis techniques helps readers make real-world use of the knowledge presented, with this new third edition containing the most current standards and methods for the post-crisis world. 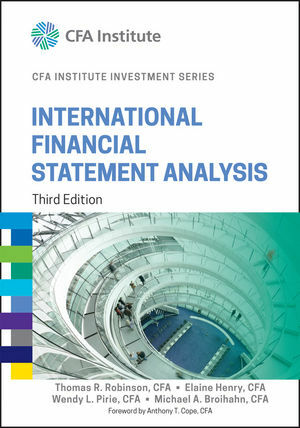 Coverage includes the complete statement analysis process, plus information on income tax accounting, employee compensation, and the impact of foreign exchange rates on the statements of multinational corporations. Financial statement analysis gives investment professionals important insights into the true financial condition of a company. With it, realistic valuations can be made for investment, lending, or merger and acquisition purposes. The process is becoming increasingly complex, but this book helps readers deal with the practical challenges that arise at the international level. Amid an uncertain global economic climate, in today's volatile international markets, the ability to effectively evaluate financial statements is a critical skill. Standards and conditions are continuously evolving, and investment professionals need a strong, up-to-date resource for the latest rules and best practices. International Financial Statement Analysis provides this and more, with clarity and expert advice. THOMAS R. ROBINSON, PHD, CFA, is Managing Director of the Americas at CFA Institute. WENDY L. PIRIE, PHD, CFA, is Director, Cur-riculum Projects, in the Education Division at CFA Institute and served as editor for this book. MICHAEL A. BROIHAHN, CFA, is Associate Professor of Accounting at Barry University in Miami Shores, Florida.